Beautiful property. Probably the best cabin that we have stayed at since coming to the mountains the last ten years. We loved the porch and the view. Would definitely stay again. We loved the amenities and it was a reasonable distance to Bryson City. Beautiful view, great hot tub, spacious kitchen and rooms. Impeccably clean. The cabin exceeded our expectations, everything was perfect! We originally booked thru AirBnB and we called the GSCR office to extend our stay and the staff was very nice and helpful. Everyone is always extremely friendly & helpful. We have used GSCR before. We loved the cabin and the view! Breathtaking views and surroundings. Lovely cabin, equipped with everything you can possibly need. Enjoyed the vistas from the cabin, the train ride to Nantahala Gorge, horseback riding in the National Park, fly fishing in Cherokee and plating with the dogs. Thank you so much for allowing us to stay as we sought shelter from Hurricane Florence. It is a beautiful retreat. The views are breathtaking. We visited Bryson City and Cherokee. The cabin was well appointed and spacious for the 6 of us. We enjoyed the pool table and hockey and especially the Hot Tub. Newlyweds!! We loved the view and the Jacuzzi! We brought our 3 labs and they loved sitting on the porch enjoying the cool breeze and we did too! Very homey feel. The cabin had everything we needed. We couldn't get enough of the view. If we had any questions, they were on top of it and helped. We loved this cabin. The views were amazing. And we were able to bring our dogs which was nice. We were very comfortable and had a great time. The team was nice and helpful. We loved the view from the balcony. Were recommended by a friend. 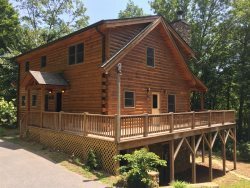 We have rented over 30 cabins on the last 35 years in GA, TN, and NC. After staying at Peace of the Mountain I don't think I'll be able to stay in ANY other cabin!!! The view? REALLY!!!!! No need to go to a scenic overlook on the Blue Ridge Parkway up the road. The deck and hot tub?? PERFECT!! The beds, kitchen with GAS stove, leather comfy furniture, great wide screen and, of course a BLUE Ray DVD player because a regular one just wouldn't be enough for this beautiful place. Everything was perfectly clean, it was the best cabin experience we have ever had. Lovely cabin! Been renting a mountain cabin since our 1st Anniversary. It's our 35th this year and one of the best cabins EVER! The cabin was well kept and clean. The cabin was perfect for our group and had everything we needed. The staff was friendly and very helpful!! Overall, great experience and i would recommend it. Our first trip to Bryson City and it was amazing! Awesome views and the cabin had a homey feel! We will definitely be back! The place was awesome! You can find everything that you will need here. It felt like we were at home...Loved the view, the game room and the decorations. It was very clean and super organized! We loved staying here! Great place to spend time with family. We can't wait to come back soon! The view is amazing and the hot tub is just perfect. Loved it! Thank you! We loved it! Thank you so much for letting us stay and make memories!! Thanksgiving weekend 2017 our first visit to Bryson City. Our family was truly blessed to stay at Peace of the Mountain. Such a beautiful cabin with amazing views. We made memories here that our family will not soon forget. Professional reservations, knowledgeable staff. Had fun toasting marshmallows. Leaf lookers from south west Florida. Mother nature was a bit fickle and the color was sparse but the cabin was fantastic. Thank you for making our stay magical.